Kids love making lists, whether they’re letters to Santa or detailed explanations of their favorite things. This is a terrific combination. You can imagine how proud I was to see Xander’s “Me Collage” displayed in the hall outside his 2nd grade classroom, where he listed all of his favorite things to play, and last but not least, at #19 is every 7-year-old boy’s favorite past-time… farting noises. So Xander made a list, but he may not have checked it twice. Farting noises has to be ahead of soccer guys, right? 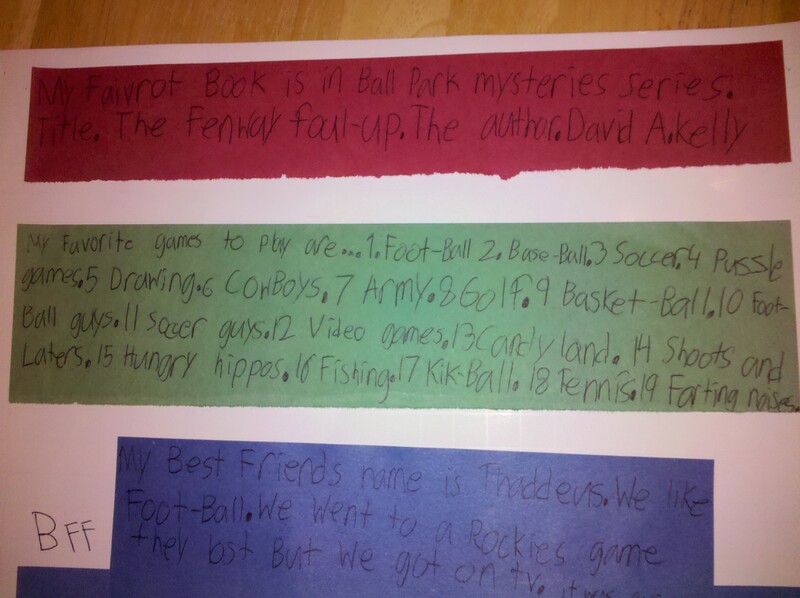 Thanks to Cathy for sharing Xander’s memorable “Me Collage” with Stuff Kids Write. HELPFUL REMINDER: Parent-teacher conferences are a great time to wander the halls and classrooms, whip out your camera phones, and snap pics of funny kid writing that you come across. Then send it to StuffKidsWrite@gmail.com. And please tell your children’s teachers about us, as well! Posted on November 3, 2011, in School Assignments and tagged children writing, farting noises, funny writing, Humor, lists, school writing assignments, Stuff Kids Write, Stuffkidswrite.com. Bookmark the permalink. 2 Comments. Love it, love it, love it! Might have to ask mine to make some lists and see what happens. OMG my 6 year old can fart under his arms AND behind his knees. WTF? ?